Colours Included: Blonde, Dark Brown & Light Brown. A Perfect Brow In Just One Sweep. Sculpt & Tame Your Eyebrows As You Enhance Colour & Brow Fullness In One Go. 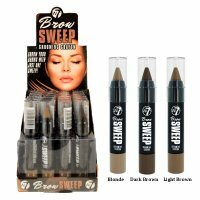 The Brow Sweep Allows You To Easily Define & Own The Eyebrow Game In Simple Strokes Along The Brow Shape.